Are we doing enough to support new recruits? ‘To find grace, watch a 16-year-old carer feed an 85-year-old woman with severe dementia, but pass by those in the office writing care plans’ (Barritt 2005). 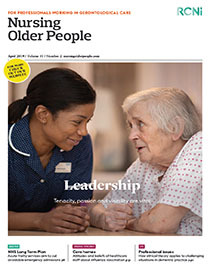 While I agree that spirituality is a ‘forgotten dimension of care’ (news May 5), it does not mean that the spiritual dimension is absent in nursing care today. Nursing is a wonderful profession filled with opportunity, but one that remains grounded in care and clinical practice.